Part six of six. The final chapter of our three-week prospect trilogy detailing dozens of MLB prospects on the rise. It’s been a fun little ride. The NL West kicked us off and now we’re ending with the AL East, a division that has given us a plethora of elite prospects over the years and will continue to bless us with the likes of Vladimir Guerrero Jr and Bo Bichette this year, and Wander Franco down the road. But those guys are not why we’re here. We’re here to find the prospects further down the rankings with the potential to make some noise this season. And in this division, there’s a bunch that fit that mold. So many that I had to leave off several names that I’m quite high on. Those are below. 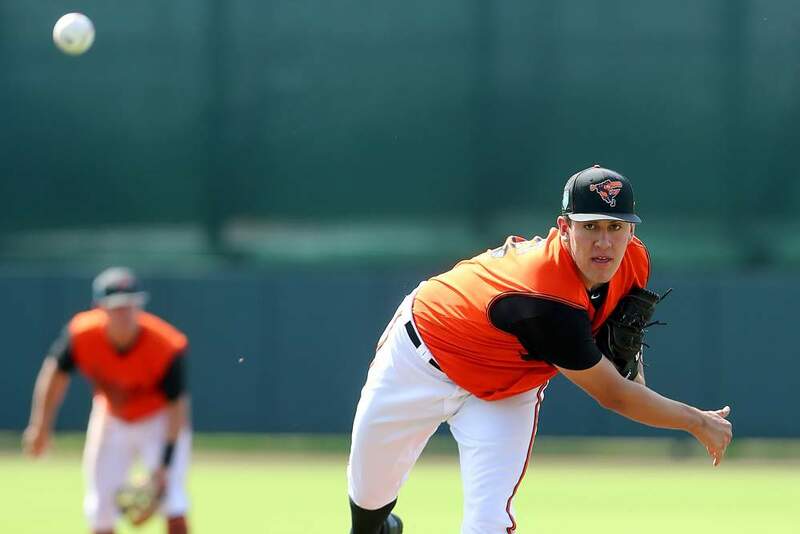 In recent years, the Baltimore Orioles haven’t had the best track record developing their high-end pitching prospects. Along with DL Hall, Grayson Rodriguez is one I believe can buck that trend. Taken 11th overall last June, G-Rod possesses three above-average to plus future value offerings in his low-90s fastball with plenty of life, big-breaking curve, and a slider in the low-80s that he’ll sometimes throw a little harder, giving it the look of a cutter. Rodriguez will also mix in a changeup, but that pitch is far behind the other three offerings. There were some naysayers on draft night when Baltimore took Rodriguez 11th, but with his dynamic arsenal, workhorse frame, and high pitchability factor, I’m Rodriguez to turn into one of the top pitchers from this draft class. The upside here is considerable. Entering the 2018 FYPD, the Red Sox top two prospects were third basemen but that didn’t stop them from taking another masher at the hot corner in Tristan Casas. I don’t blame them either. The 6’4, 240 pound Casas looks like a future middle of the order masher. His swing can get a little long at times, but he can make up for that with plus bat speed. The swing path generates natural loft and paired with his plus-plus raw power, should translate into plenty of home runs. I’d even go as far as saying that he has comparable power upside to Bobby Dalbec with better contact skills and a more advanced plate approach. His well below-average speed will likely force a move to first base, but Casas’ bat will fit in just fine over there. Once he gets his feet wet in the minors, expect Casas to get plenty of love as a top-100 overall prospect. Overall, this Red Sox system lacks the big-name star power that we’ve become accustomed to over the last decade or so. Outside of the top-3 guys, the rest of the system is filled with a ton of question marks. While he’s still years away from the big leagues, Antoni Flores is a prospect with the tools and upside to develop into another big name in this system. The Sox nabbed Flores in the 2017 J2 period for $1.4 million as one of their three big signings that year (R.I.P. Daniel Flores) along with Danny Diaz. While Flores doesn’t nearly have as much power as Diaz, he’s miles ahead in both his plate approach and contact skills. Flores has shown the ability to spray line drives to all fields with plenty of bat speed, clean mechanics, above-average contact skills, and strong plate coverage. He’ll need to add some strength to his frame and loft to his swing, but there’s 15-20 homer upside here in time to go along with around the same about of stolen bases. If Flores continues hit for a high average while adding some pop and speed during his first full season in 2019, there’s a strong chance he vaults inside my top-250 by the end of the season. Recently, I went on the ProspectOne podcast with Chris Welsh to discuss breakout prospects for the 2019 season. My pitcher breakout? You guessed it, Luis Medina. If you catch Medina on a day when his command is there and he’s locating his pitches, you’d think you’re watching a future frontline starter. And that assessment wouldn’t necessarily be wrong. However, that command being there consistently for Medina has been the problem. Not just a little problem either. We’re talking a gargantuan problem. An 11.5 K/9 is a damn good rate. An 11.5 BB/9? Not so much. There’s no denying that Medina has the arsenal capable of landing him at or near the top of a Major League rotation one day. A mid to upper 90’s heater with life and sharp low-80s curve with 12-6 action highlight his arsenal, with both grading as plus-plus. His changeup isn’t as advanced but has shown signs of becoming at least serviceable, if not above-average. If the command improves, expect to see Medina shoot up prospect rankings this season. With his clean mechanics and how he looked in fall instructs and in spring training, I feel rather confident that he makes progress this season. There are approximately 1.6 million promising pitching prospects in this system. That’s honestly only a slight exaggeration too. We already discussed Luis Medina above who has frontline starter potential if he can keep his command and control in check. Medina arguably has the highest upside in the system. I only say arguably because of the equally as high upside of Deivi Garcia. Though he’s a little on the smaller side at 5’10, Garcia’s repeatable delivery and plus arm speed allow him to routinely sit in the low to mid-90’s with strong arm side run on his heater. Pairing with that is a plus-plus curveball with strong downward bite that generates a ton of whiffs and weak contact when he’s able to locate it down in the zone or below. The changeup is well behind, but has flashed above-average at time with some fade and should be a serviceable third offering at least for Garcia. With this type of arsenal and above-average control, Garcia has been able to dominate the lower levels (career 2.81 ERA, 1.02 WHIP, 12.4 K/9 in 182.1 IP) and should allow him to rise up towards the elite ranks of starting pitching prospects this season. You’re going to want to grab a towel for this one. Antonio Cabello oozes potential. Go ahead, wipe up all that potential off the floor, Cabello will just ooze more after your done. Have I ever used ooze twice in one article? Doubt it. Signed in December of 2017 out of Venezuela, Cabello shows plus bat speed and contact skills from the right side with above-average raw power and some natural loft to his swing. To add to that, he possesses even more upside on the bases. All of these beautiful offensive tools were on full display in rookie ball last season with 19 extra-base hits and 10 steals in 159 at-bats. What was just as impressive was the 14.1% walk rate. Once Cabello learns to incorporate his lower half more, the power should grow, turning Cabello into even more of an offensive monster. The Yankees were quite active during the 2018 J2 period, signing three high-profile international prospects. While Antonio Gomez and Osiel Rodriguez are intriguing prospects in their own right, the prospect from this class I’m the most excited about is shortstop Alexander Vargas. A switch-hitter out of Cuba, Vargas displayed above-average to plus contact skills with a good feel for hitting from both sides of the plate and budding raw power, mostly from the right side of the plate. Though it’s obviously still early and he’s yet to play in a minor league game, Vargas projects to hit for a strong average with double-digit pop to go with it. Add in the potential for 25-plus steals and it’s easy to see Vargas making some noise in prospect circles this season. A 3rd rounder in 2017, Walls struggled to start his career in the NYPL but got back on track in a big way last season in the Single-A Midwest League, showing off plus speed and contact skills with a rock-solid plate approach. That strong plate approach is something he’s carried over from his collegiate days at Florida State. The contact skills and approach give Walls a firm baseline to utilize his plus speed. Even with Willy Adames and Lucius Fox ahead of him on the shortstop depth chart, it’s not crazy to think Walls could pass them both if he continues to hit like he did last season. A relative unknown in dynasty formats, Walls has the upside to enter my top-250 overall by my mid-season update. The Blue Jays might have gotten a steal when they took Adam Kloffenstein in the 3rd round last June. A big, 6’5 prep arm, Kloffenstein features a deep five-pitch arsenal with two different fastballs, two breaking balls, and a fading changeup. Both his mid-90s four-seamer and low-90s two-seamer have proved to be highly effective as inducing weak contact while his slider and change flash above-average to plus. The upside here is a workhorse #2 or #3 starter with considerable strikeout upside. He might not have been a first-round pick, but Kloffenstein has a good chance of climbing the ranks into the same area as some first-round arms are ranked. A lot of the pitching spotlight in this system goes to Nate Pearson, and rightfully so, but Eric Pardinho is right there with him when it comes to upside. After signing during the 2017 J2 period, Pardinho carved up the Appalachian League last season, posting strong ratios and well over a strikeout per inning. Already with two plus pitches in his low-90s running fastball and hammer curve, Pardinho will also mix in a slider and changeup that aren’t quite as advanced but serve as serviceable third and fourth offerings. If he can continue to develop the secondaries and keep his command in check, there’s massive upside here. After 2019, the gap between him and Pearson might be a lot smaller than it is now. The time is now to get on board before his price truly skyrockets. 15 years old and throwing ?? in the 90s. For the last few years, Anthony Alford was the outfield prospect creating the most excitement in this Toronto system. Not anymore. Some may disagree, but Chavez Young has passed him in my opinion. Furthermore, I’m all aboard the Chavez express, grabbing him wherever I can in dynasty leagues. After hinting at breaking out in 2016-2017, Young busted out in a big way last season, especially in the speed department. That speed, along with his above-average contact skills, budding power, and improved plate approach have me excited about what he can do for an encore in 2019. If you’ve been reading my work this offseason, the name Durbin Feltman should look quite familiar at this point. Simply put, he’s the Boston Red Sox closer of the future. On top of that, his ETA is this summer with the chance to factor into the saves picture later this season depending on the performances of Matt Barnes/Ryan Brasier and whether or not good ol’ Dave Dombrowski wants to trade for a closer before the deadline. Regardless, Feltman is an elite reliever waiting to happen with a mid-90’s fastball and sharp slider, both of which grade as plus, and solid command of both pitches. Two relievers on this list? No, I haven’t lost my marbles…. yet. Photo/Video Credit: Jason Woodell, Ben Palmer, Cliff Welch/Icon Sportswire, Josh Norris, MLB.